Arab, F., Jafari Azar, Z., Nejad Ebrahimi, S., Amin*, G. (2017). Extraction, quantification, formulation and evaluation of oral capsules from burdock fruits. Research Journal of Pharmacognosy, 4(Supplement), 88-88. F. Arab; Z. Jafari Azar; S. Nejad Ebrahimi; G.R. Amin*. "Extraction, quantification, formulation and evaluation of oral capsules from burdock fruits". 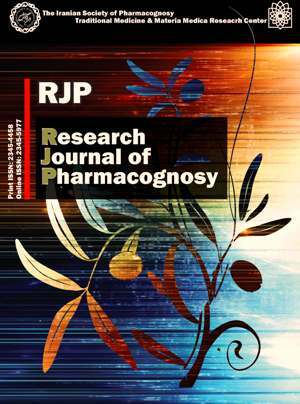 Research Journal of Pharmacognosy, 4, Supplement, 2017, 88-88. Arab, F., Jafari Azar, Z., Nejad Ebrahimi, S., Amin*, G. (2017). 'Extraction, quantification, formulation and evaluation of oral capsules from burdock fruits', Research Journal of Pharmacognosy, 4(Supplement), pp. 88-88. Arab, F., Jafari Azar, Z., Nejad Ebrahimi, S., Amin*, G. Extraction, quantification, formulation and evaluation of oral capsules from burdock fruits. Research Journal of Pharmacognosy, 2017; 4(Supplement): 88-88. 1Pharmaceutical Sciences Branch, Islamic Azad University, Tehran, Iran. 2Department of Pharmaceutics, Pharmaceutical Sciences Branch, Islamic Azad University, Tehran, Iran. 3Department of Phytochemistry, Medicinal Plants and Drugs Research Institute, Shahid Beheshti University, Tehran, Iran. 4Department of Pharmacognosy and Medicinal Plants Research Center, School of Pharmacy, Tehran University of Medical Sciences, Tehran, Iran. Background and objectives: Burdock (Arcticum lappa L.) is a Eurasian species of plants in the sunflower family and has been used for hundreds of years by scientists and traditionally in North America, Europe, Asia and especially in China. It has also been used in gouts, hepatitis, blood pressure and other inflammatory disorders. There are several major compounds in different parts of this species and the main ingredients of the fruits, are arctiin and arctigenin. Methods: In this investigation, we obtained the dried seeds of burdock from Jahad Keshavazi Institute of medicinal plants, Karaj, Iran and ground the fruits and extracted them with ethanol 70% via maceration. Extracted material was filtered and analyzed by HPLC. Results: Quantification of Arctiin via HPLC analysis showed that it was 396.32 mg/g in the total extract. Conclusion: Depending on the measured arctiin, various oral capsule formulations were evaluated using the fruit extract and common fillers, such as Avistel 102, starch and lactose. The standardization of capsules was based on the presence of 396.32 mg/g of arctiin in each 250 mg capsule.